The delivery of basic social welfare services in South Africa is hindered by a huge shortfall in Social Worker numbers, estimated to be around 77%. In this context, the work of NGOs becomes critical to fill the gap and provide support to those in need. Realising the important role played by these organisations, the Community Chest developed Capacity Building Training aimed at uplifting NGOs by providing them with the skills they need to access funding and operate effectively. 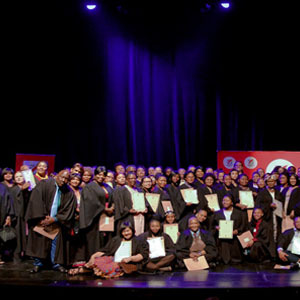 This week over 200 NGO members from across the Western Cape celebrated their successful graduation. Unfortunately, due to a lack of governance and management skills, NGOs can struggle to qualify for the funding they require to work efficiently. The Capacity Building Training endeavours to provide NGOs with the training they need to foster financial sustainability, sound governance and strong leadership qualities in their organisations. The programme includes ten modules – from Basic Organisational Development, which explains the basic requirements needed to apply for funding and how to implement them – to courses on project management and financial literacy. Comments Yumna Martin, Manager of Capacity Building Training: “The Capacity Building Programme strives to provide South Africa’s NGOs with the skills and the resources they need to flourish. The training is intended to encourage these organisations so that they can offer effective support to the most vulnerable members of our society”. In the past five years over 3500 people from 300 organisations have benefitted from the training. This week, at the Baxter Theatre in Rondebosch, the Community Chest of the Western Cape was proud to celebrate the success of even more NGO leaders of the future.